It has now become a national pastime for howls and protests on our streets on a daily basis. Are these protests because the Government has so far failed to deliver on the promises they made on 8 January to the public, or what? 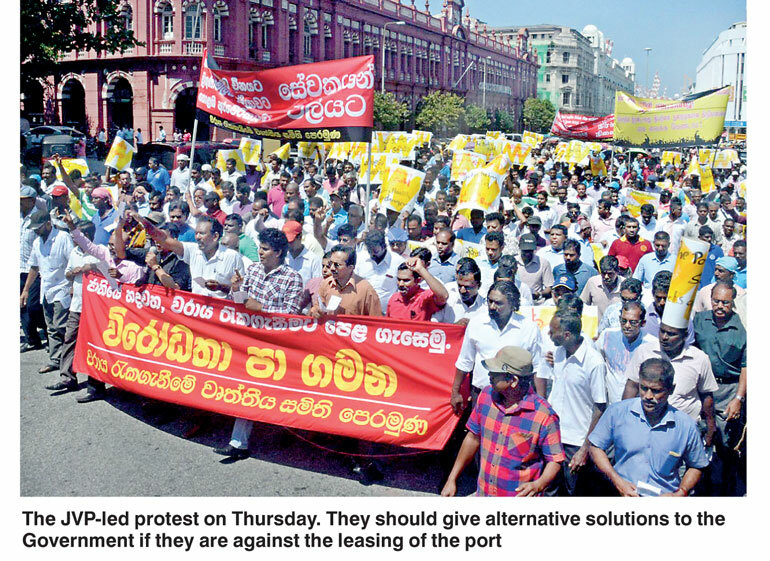 The latest protest on Thursday was about the handing over of the Hambantota Port to the Chinese for $ 1.5 billion. The reason the Government is forced to give a lease to a Chinese company is because the Government does not have the income to service the loan taken by the previous Government. A few years ago when Mihan Lanka was set up using public money, very few people howled. Mihin Lanka as an entity currently owes the State banks billions, a debt that has been outstanding for years with no action being taken by the State banks to get its money back. Mihin Lanka and SriLankan Airlines got billions from the UPFA Government’s budgets to run their operations. This is one of the many reasons this country is struggling to cover its debt burden. In fact the current Finance Minister Ravi Karunanayake, an accountant by training while in the Opposition, pointed out that the then Government squandered Rs. 3.7 billion on Mihin Lanka, leaving no assets to show, and they were given another Rs. 6 billion and was losing Rs. 4 million a day. If all that has been said about Mihin Air is true, the persons responsible for plundering public money must be prosecuted. The mismanagement of SriLankan Airlines is another sorry story. Why is the public and the Government going slow on those investigations? Why is the JO silent on those? This type of financial corruption is the worm eating at the heart of society. The judges and investigating officers must do their best to make political leaders accountable to the rule of law, but judges and magistrates are themselves governed by laws. When these laws do not enable them to succeed in their task, it is Parliament alone that can bring the solution, often under the pressure of public opinion. Given that SriLankan Airlines is a commercial non-starter without a partner, the question of how long SriLankan Airlines can survive is a function purely of how much of money the State will be willing to rake out in the coming months and years to fund the airline and that would entirely depend on the Government’s will to stop unproductive expenditure to bring down the fiscal deficit. The priority for the Government now should be to ward off a possible economic slowdown given the current economic situation globally being extremely challenging and very unpredictable. Public opinion consists of the views held by the population of a state that influence those in power. In a democratic state, politicians must listen to public opinion if they wish to keep their jobs. Dissatisfied constituents can vote out those who ignore their views. Advisors and officials appointed by the politicians to implement policy also need to pay attention to public opinion to protect the government and to ensure their survival. After many years we have political leaders who seem to care about the democratic way of life and also a persistent civil society that do not give up and can swing the pendulum back towards greater accountability and transparency at any given time. And it shows how much leaders can achieve, even in a short period of time, when they are willing to engage the people they serve. The great Aristotle once observed that no state would be well administered unless and until civil society holds sway. This is very true in Sri Lanka and in many developing countries. People elect leaders for five to six years, watch in silence while they do what they desire for that period and then attempt to throw them out in disgust and hope for a better deal from the next government. This attitude of electing dictatorship for six years is not the essence of democracy. Civil society on an ongoing basis should hold political leaders accountable and responsible for their actions. However to achieve this there has to be more activism and advocacy on the part of all civic groups and of course a greater involvement in politics by all sections of society. More than ever today civil society has a special role to play in reducing the bitterness of politics in our country. In Sri Lanka the polarisation and divisive nature of Sri Lankan politics has without doubt prevented the emergence of a national consensus for many of our problems. Therefore the only way in which greater political consensus can be achieved is if the professional and middle classes of the country become politically active and make greater demands from their elected leaders. We all know politicians in Sri Lanka have made a caricature of democracy over the past 25 years by making politics vicious, polarised and personalised. This cycle of violence can be broken if professionals and business people were to persuade our political leaders of the futility and self-destructive nature of this approach. In the current context not only our politicians but all our opinion makers in this country have a national responsibility to help the current Government to find a lasting solution to the political question in the north and east and get them to commit itself fully to a true Sri Lankan identity. Civil society could demonstrate their commitment by collectively acting as independent conscience groups to pressure all groups to look at national issues constructively and to realise that whether we think our blood to be blue, red or green, we are above all, Sri Lankan. In the final analysis, the Mathri-Ranil combination is the best and last chance we have to create a true Sri Lankan identity and also to start living that identity.